Rich and creamy, these lovely chocolate pots are perfect for dinner parties as they are easily made in minutes and can chill in the fridge while your guests are eating the main course. Finely grate 1 square of chocolate and set aside. Roughly chop the remainder and place in a heatproof bowl with 3 tablespoons of cream. Place over a pan of simmering water and leave until melted, about 2 minutes, then stir. Remove from the heat and beat in the brandy or liqueur, remaining cream and half the yogurt. 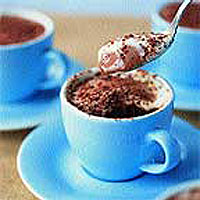 Pour into 4 x 125ml coffee cups or ramekins. Spoon the remaining yogurt over the top and sprinkle with the grated chocolate. Chill for at least 30 minutes before serving.